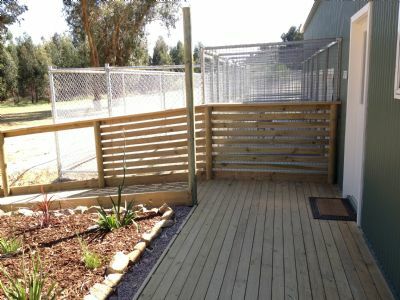 Our facilities have been designed with your dogs' comfort in mind. 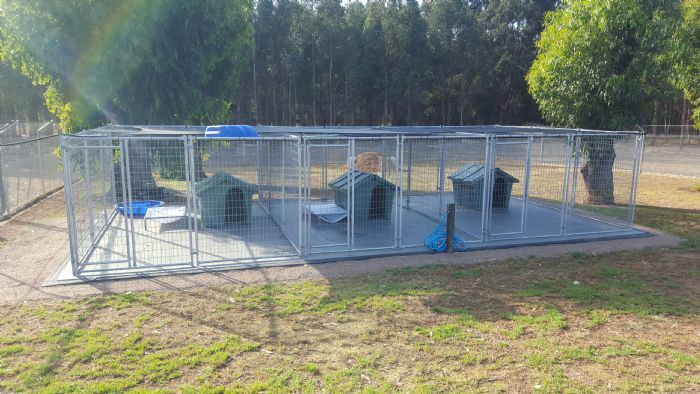 We have 12 kennels that have walk in, walk out yards, 3 large grassed exercise yards, into which, your dogs will be let out into for playtime at least twice daily. 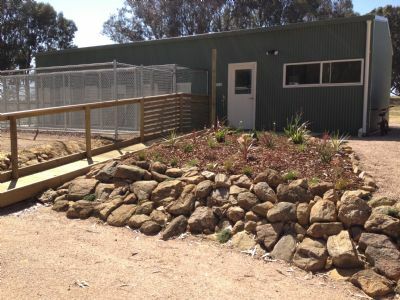 The inside part of the run has a 1.2 metre solid dividing wall separating each kennel, offering our guests their own "private" quarters, which they will be able to eat or relax in while feeling safe and secure. 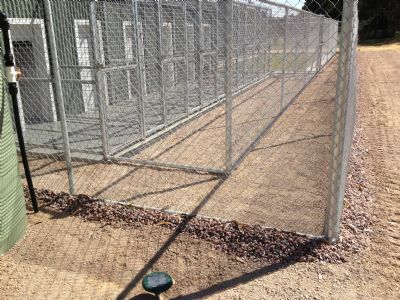 The kennels are also fully insulated to keep everyone warm in winter and cool in summer. 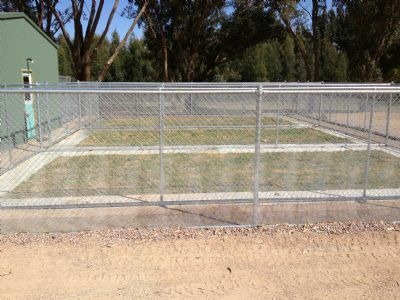 One of our exercise yards has been fenced to cater for escapologists. It is 2.4 metres high with the top metre angled in at 30 degrees. All of our yards will be fenced like this shortly. Please let us know when you bring your dog to stay if they will need to be exercised in this yard. Our facility is double fenced. The external fence has 1.2metre snake wire attached that is buried into blue metal to ensure the safety of our visitors. 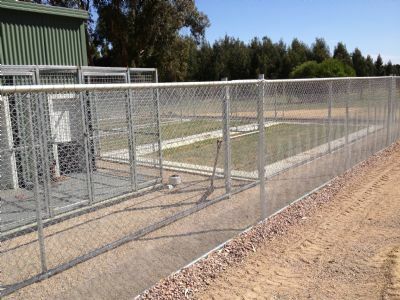 We also have four Snake repellers installed around the kennels. Our DayYards have been specifically designed for day stays. They are spacious and roomy with room for a paddle pool and sack bed and have an extra large kennel for the biggest of visitors. There is shadecloth covering the entire roof as well as shade from our Tuart Trees. They can then go out and have a play in our large exercise yard. 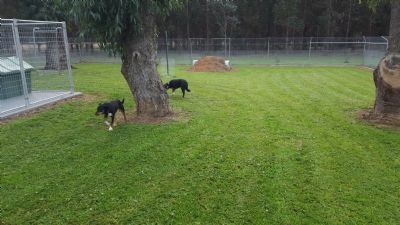 We have a large, secure, grass exercise yard with a concrete tunnel and large trees for our dogs to explore. They can stretch their legs, play ball or have a good sniff whilst wandering about. The outside run offers extensive views of surrounding, well established trees and farming land. They will be able to get lots of fresh air and stimulation as we will make sure they have quality one on one time with us while they are here. Warm, soft bedding is provided, as are SnuggleSafe warm disks, toys and clam shells for those that enjoy them. We are happy to put jumpers and coats on those guests that wear them. All of our dogs are fed on Black Hawk Holistic Formulas. This is a Super Premium dry dog food that is Australian made, owned and uses Australian produce. We also have Natures Gift tinned food for those that like that, as well as raw beef, roo and goat. We have a range of natural Australian treats for sale that can be purchased and given to your friend during their stay. If your dog requires a special diet or cannot have certain things, you are more than welcome to bring your dog's regular meals with them as we want to make sure they do not end up stressed or with a tummy upset from eating a different diet than what they are used to. All we ask is the food to be split into daily portions and labelled with their name. In case they need to stay an extra night or two, please make up a couple of extra meals. We will happily administer any medication your dog requires. All medications need to be clearly labelled and stored in an appropriate container.